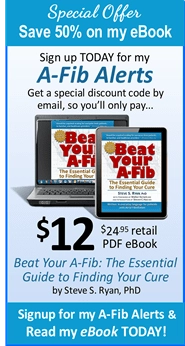 You can have A-Fib without Flutter and A-Flutter without A-Fib. But more often than not, they are linked. Atrial Flutter can be considered as a milder or more ‘organized’ form of A-Fib. But A-Flutter is still as dangerous as A-Fib. 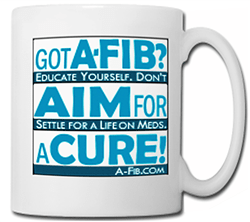 If you have A-Flutter, A-Fib often lurks in the background or develops later. 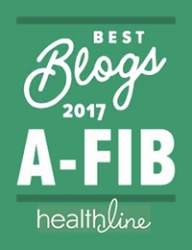 While most of the information on A-Fib.com applies to Atrial Flutter too, I offer you a list of my top articles about Atrial Flutter. 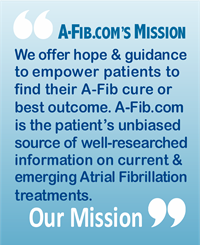 • FAQ: Does your information about atrial fibrillation apply to a-flutter, as well? • Atrial Fibrillation and Atrial Flutter: Cause and Effect? • Reader With A-Flutter Advises Two Lifestyle Changes. • A-Flutter At High Altitude In Colorado; A personal A-Fib story by Tom Burt, Houston, TX. BONUS VIDEO: Atrial Flutter: Fast Heartbeat Arrhythmia. Short clip illustrates how the AV node, a cluster of cells located in the center of the heart between the upper and lower chambers, slows down the electrical signal before it enters the lower chambers. (:28 sec.). Additional reference: For an in depth article about Atrial Flutter see the post by Dr. John Mandrola, Atrial Flutter—15 facts you may want to know. 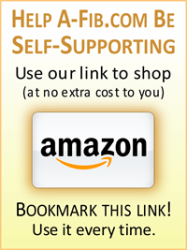 Published on DrJohnm.org. 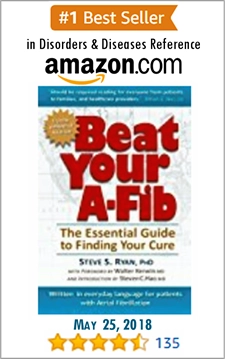 FAQs Understanding A-Fib: Flutter and A-Fib—Does one cause the other?